We offer general dentistry, as well as denturist services. Limited Saturday availability. Please call the Dental Contact Center at 503-286-6868 for details. If you need urgent or emergency dental care, call the Dental Contact Center at 503-286-6868. Saturday appointments are available, though not always at this particular location. If you have a dental emergency outside our service area, go to the nearest dental care facility. You have limited coverage for qualifying emergency care. Please remember: If you need emergency or urgent care, you may have to pay $25 in addition to your normal office visit charge. See your summary of benefits for a description of your urgent and emergency care benefit. 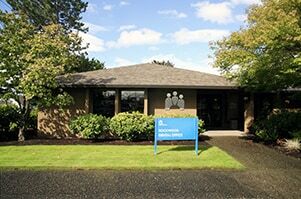 NOTE: For our Traditional dental members, care at facilities not owned by Kaiser Permanente is covered only if you experience a dental emergency as described above and you are outside our service area. Follow-up care and care for urgent conditions are covered only when provided in a Kaiser Permanente dental office. For our Dental Choice PPO members, you can choose from a network of providers and facilities including Kaiser Permanente dental offices. You may be balanced billed if seeking treatment with nonparticipating dentists in the Kaiser Permanente Dental Choice PPO network. Please refer to your Evidence of Coverage (EOC) for more information.